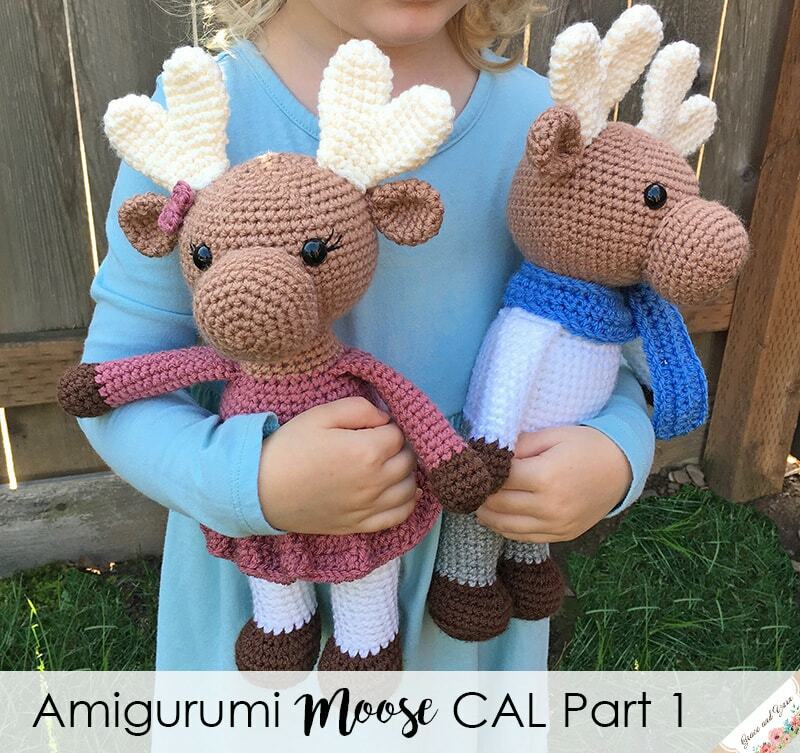 Welcome to Part 1 of the Amigurumi Moose CAL! I'm so excited you're here and joining in! Today we will make the legs and body, the legs will be made separately and then joined together to make the body. By the end it will all be in one piece without any sewing needed! Feel free to make Miles, Millie or both! I'm so excited to see all of the colors you've picked out! If you are just learning about the CAL head over here to find out all the details, it's never to late to join in. 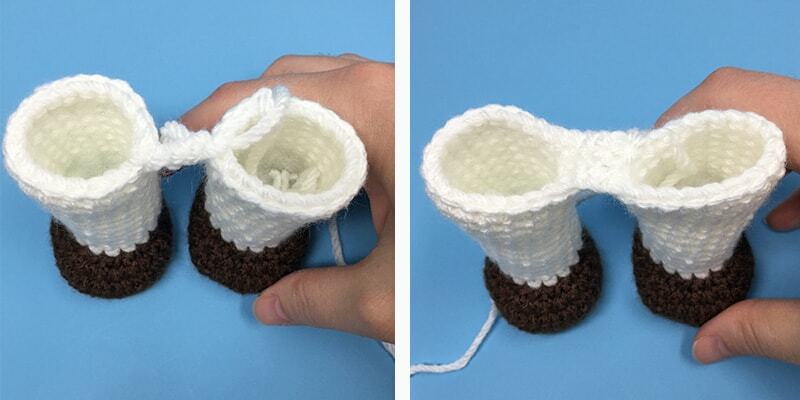 Each part will remain free here on the blog so you crochet at your own pace. Be sure to share your photos in the Grace and Yarn Crochet Group on Facebook, we'd love to see them. This is also a great place to ask any questions you have along the way! You can also find the full pattern (an ad-free PDF version) in my Etsy and Ravelry shop! Some of you have shared that this will be your first CAL, yay! If you have any questions feel free to share them in the group or send me a message. I hope you enjoy making your own little moose! If amigurumi is new to you, I have a Tips to Learning Amigurumi page that I think will come in handy. I've also brought over some of the main tips below as a refresher if needed! If you're ready for Part 1 now, feel free to scroll down. Otherwise, keep reading and I'll go through the materials and how to get started with a magic circle and color changes! Don't want to miss any new patterns? Sign-up for my newsletter and I will send an email for each part of the CAL plus keep you updated when new patterns are posted! 3. Insert your hook into the circle, yarn over, pull through and chain 1. 4. You're magic circle is complete and ready to begin as pattern instructs (ex: if round says 6 SC you will complete 6 SC around the loop). 5. Pull your tail tight to close. 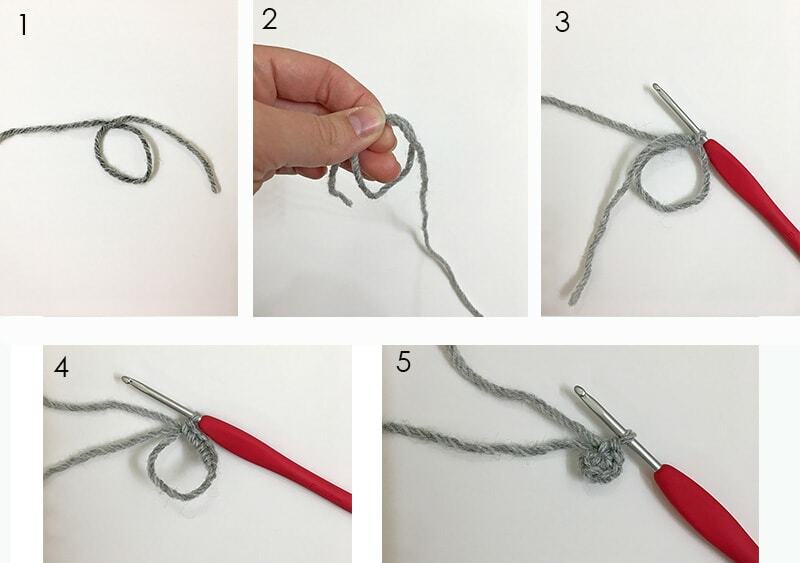 An invisible decrease happens over two stitches, insert your hook into the front loop of the first stitch and then into the front loop of the next stitch (you will have 3 loops on your hook), yarn over, pull through two loops (you will have 2 loops left on your hook), yarn over again and pull through all loops on the hook. You're invisible decrease is done! When changing colors it can give a jagged look because we are working in rounds. This method will help the colors change more smoothly! 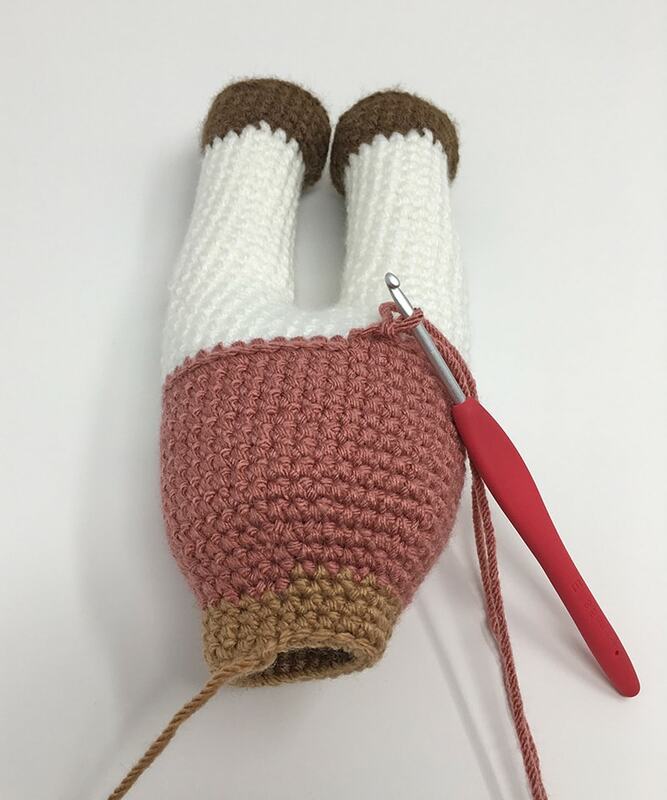 When you are completing the last stitch before you are instructed to change colors you will complete the first half of the stitch with your old color and finish the stitch with your new color. 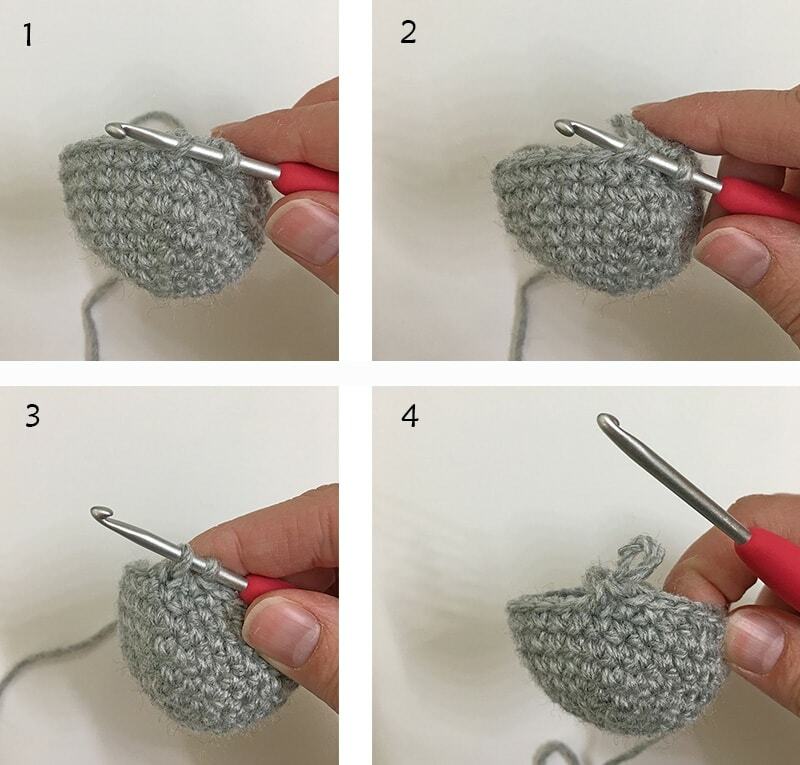 Insert your hook into your stitch, yarn over with the old color and pull through, now drop your old color and use your new color to yarn over and finish the stitch by pulling through all loops on your hook. You now have your new color on your hook, I like to tie off my old color here. 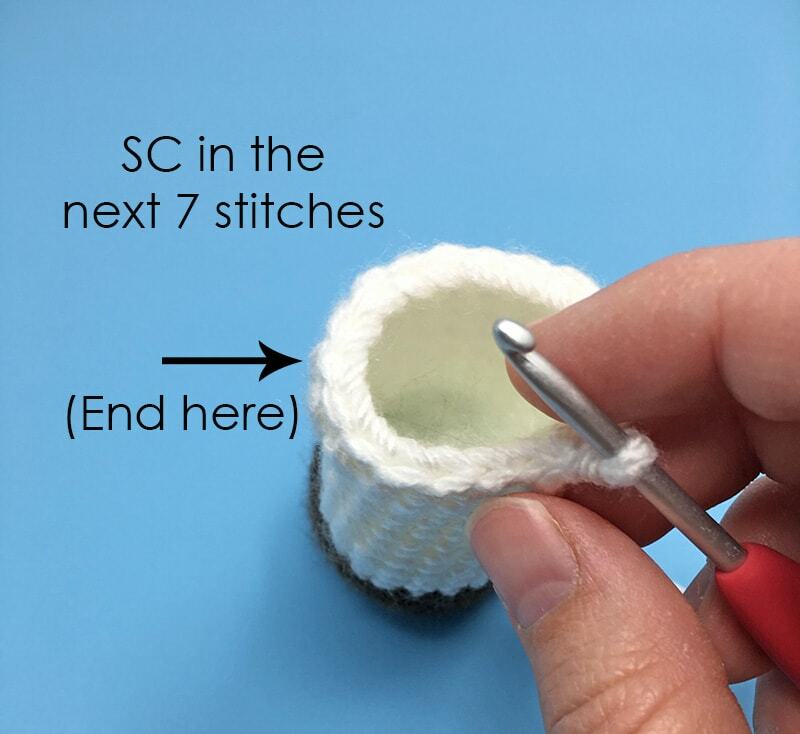 As you start your next round, complete the first stitch as a slip stitch instead of a SC. When you come back around to start your next round be sure to SC into your slip stitch just as you would a regular stitch. Fasten off on the first leg only. At the end of Round 23 on the 2nd leg, complete a SC in each of the next 7 stitches (this will line up our feet to be straight when we join). Round 24: Chain 3 and attach to the first leg with a SC (make sure both feet are facing the same direction), SC in the remaining stitches around the leg. When you reach the chain make a SC across each of the 3 chains, SC in the remaining stitches of the next leg and SC across each of the 3 chains again (you will have SC on both sides of the 3 chains now) (42) This completes your join and is where your next round will start. If you are only making the boy version you are done with Part 1! If you are making the girl version follow below to add the ruffled edge to her shirt. You are all set and ready for Part 2, where we'll make the head, ears and antlers! I hope you all have a great weekend!